We recently had a client with a unique requirement for searching for jobs within Career Site Builder sites. The client owns and operates several subsidiaries across the country, but wanted to use a single career site so that a user could search for jobs across the entire company. Each of the subsidiaries would have its own strategy page. 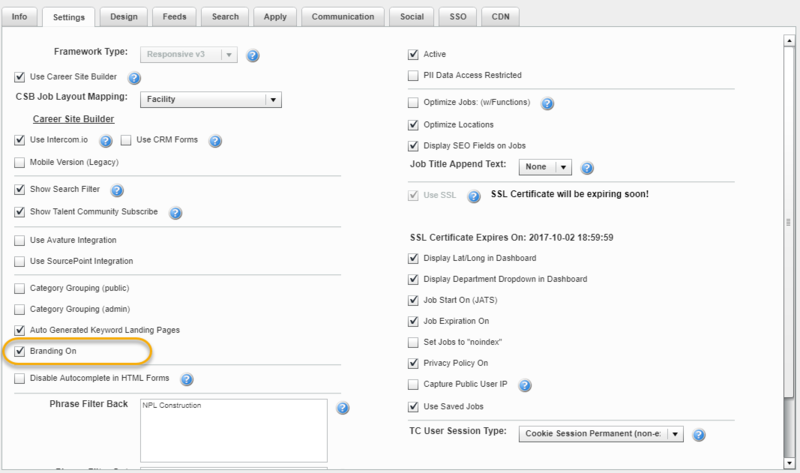 If a user navigated to a subsidiary’s strategy page, only jobs for that subsidiary would display – which is typical and easy enough to set up. However, what was more difficult was the requirement that if a user used the search bar on any of the subsidiaries pages, only jobs for that subsidiary would display, which is not a typical set up of a CSB site. Typical setup is that even if a search is done on a strategy page, all jobs across the client’s site will be searched for and displayed. It does not matter if it fits the rules of the strategy page or not. After much research, the team and I determined that there is a way to limit search functionality on strategy pages as long as branding was being utilized. In our setup below, the client has several subsidiaries (Red, Yellow, and Blue) that need their own strategy pages with limited searching. We are going through the exercise to create blue, but it needs to be repeated for each subsidiary. There is a 1:1 relationship between strategy page and brand. Navigate in BizX to Admin Center>Recruiting>Manage Recruiting Sites, then click Add New. A new site will be added to the displayed list. Click take action, then edit to edit your new site. In the site settings that display, capture everything after the equal sign in the URL. You’ll need it for later. Repeat for any and all strategy pages that you need to make. The first thing we wanted to do was set up a custom field on the requisition that would dictate what strategy page the job would be posted to. This field was simply a drop down with the strategy page name. The field was then mapped in Set Up Recruiting Job Field Mapping to “Brand”. ***Brand can be mapped to other fields on the requisition, however for this client we created our own for strategy page. You will first need to make sure that Branding is on for your site. Log into Command Center, select your site, then go to Site>Site Setup>Settings. Make sure that Brand is checked off. Next, you will need create Brands for each of your individual strategy pages. To do this, go to Site>Site Brands. In the box at the top, add a brand name for each of your strategy page. The brand name should be the strategy page name from the drop-down selection field on the requisition. Then click Add Brand. Once the brand is added, you’ll be able to type into the MircoSite Identifier field. Add that tail end of the URL you captured when you added the new external site and click Save. Next, you will need to make the rules for your strategy pages in Command Center. Navigate to Categories>Add New. Give your rule a name, make it active, and set the Brand to the strategy page selection. Next, click Rules. Add the rule “brand:strategy page selection”. In our case, “brand:blue”. Click save. Repeat for any and all strategy pages/brands you have. 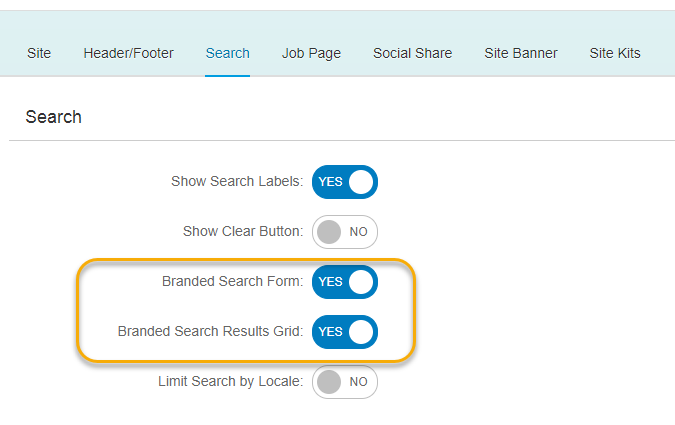 Once you have all your external sites, brands, and strategy pages created, we need to change settings in Career Site Builder to limit the searching. Navigate to CSB, Global>Settings>Search. Turn on Branded Search Form and Branded Search Results Grid.